Voice of the Collector: Future McFarlane SportsPicks To Contain Game Used Material? Future McFarlane SportsPicks To Contain Game Used Material? What's the Collector Level™ program about? We are expanding our current Classic Chase and Super Chase figure releases into a consistent marketing program by developing the Collector Level™. McFarlane Toys will produce special Level figures for the Collector Level™ program. There are six Levels in the program; Bronze, Silver, Gold, Premier, All-Star and MVP. Each Level matches to a limited production range. Nearly, every standard figure in a series will have an alternative figure; either a Collector Level™ or Classic Chase figure. What's special about the Collector Level™ figure? The Collector Level™ figures are limited in production. 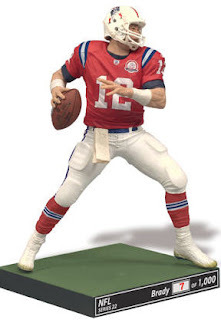 Each Collector Level™ figure will vary from the standard figure by having alternate uniforms, base variations, trophies, awards, accessories, possibly authentic player signatures, original or replica sports memorabilia or even pieces of actual uniforms or equipment. Each Level figure will be sequentially numbered on the base, includes the players' last name and the series name for authenticity. Each Level will have a production range minimum and maximum quantity matched to the specific Collector Level™. In addition to the Collector Level program that will roll out with 2010 products, another significant change has been made to the SportsPicks packaging, namely an all clamshell design. This is significant because as any figure collector knows, the collectibility and future value is heavily dependent on package condition. However, McFarlane's, like must figure, display best when freed from their plastic tomb. The clamshell packaging will although for easy access for display without hurting the packaging if the collector decides to sell. This is a VERY welcome addition. Cooperstown 7, is when these changes should begin to hit. You can read the complete press release with other FAQ's here. What do you think of these changes? I liked McFarlane figures a while ago, but then it seemed they became more mass produced and the quality suffered. I also grew tired of finding that all the variants/chase versions were taken by the store clerks before I had a chance to look (whining I know). Would McFarlane do better by having a closed package? Meaning you didn't know who you were getting when you bought it? More like a pack of cards? Interesting thought but I do not think it would work as these are mostly purchased by player and team collectors. As for the store clerk thing, honestly, that was the first thing I thought as well. Has anyone actually seen the CL gold favre 4 pack TRU exclusive with him in the white falcons jersey i have yet to see one even show up on ebay yet?